Because I am interested in all things architecture/design and my BFF, Ashley, is interested in all things Russia, I thought I would share. The world's largest building is about to be built in Moscow by Foster+Partners. Many other firms make drawings and announcements to build the biggest, the baddest, the something-est in the entire universe and they never come to pass, but Foster+Partners have a wonderful history of designing out of this world projects and actually building them to completion. It is not going to be the tallest building in the world, but it is going to be the world's fattest building and possibly even its phattest building. Naturally I question projects with plans to be the biggest. In a world where we should be aware of the possibility (and reality) of climate change, the biggest-ugliest-most badass of things often seem excessive. Excessive, like my barely over 5 foot tall mother's Diesel powered Excursion with a lift kit. 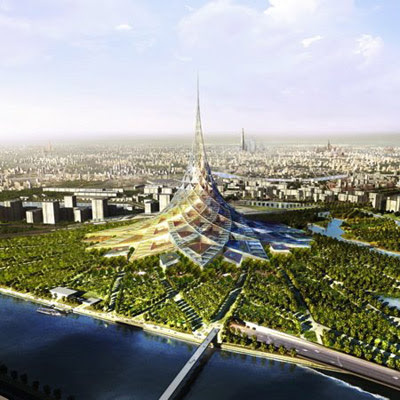 But the plans for Crystal Island are filled with green, Earth friendly, people friendly design elements like solar panels and wind turbines to generate power and atriums that act as natural ventilation and insulation for the building. The building's size has a purpose too, it is a barrier that is meant to protect people from extreme weather and the pollution has made living conditions in the area undesirable and unhealthy. It is a city within a building. So cool, rad, right? When it is built maybe I will want to go to Russia with Ashley. Something to see besides the sword shaped bottles of vodka that she tells me about, but I must admit they do sounds pretty cool. we are so going to russia. that is rad. that's so close to my mission too!